Running. It’s not something that comes naturally to me. Let’s be clear. I don’t run. And if I do it kinda resembles something like Phoebe from Friends, except with more sweat. A lot more sweat.And tears. Both mine and no doubt those of the people watching the spectacle of me huffing and puffing along with a face the colour of beetroot; limbs flailing all over the place. And yet somehow I find myself signed up for an 8k run through the streets of Galway with little over two weeks to go. No training done-I don’t even own a decent pair of runners. How did I get here you may ask? From a desire to raise money for vital services needed by Mini which I’m hoping will somehow be enough to get me over the finish line. The last two years have seen us raise nearly €2000 for Down Syndrome Ireland by hosting ice-cream parties which have been a lot of fun and were very popular. Who doesn’t love ice cream? They require a good bit of organising, however, and this year with two kids under 3, me returning to fulltime work and possible new projects looming on the horizon for the Frenchman, we just haven’t had the time to organise a party. I’m conscious of the fact that I need to keep up with the fundraising for our Mini. Services are being cut left, right and centre and it falls back on us, the parents of kids with special needs to get off our arses and make sure enough funds are available to cover the cost of services for our little ones. I wish I could do more but right now there just are not enough hours in the day. So I’m doing a run. It all seemed easy enough-register online, get a sponsorship pack, set up an online account where people can donate money to and get running! I’ve endured two pregnancies, surely an 8k will be a doddle compared to them, right? Saturday 9th August is when I find out! I’ll be running to raise awareness and funds for Voices for Down Syndrome Galway. If any of you lovely people would like to sponsor me, you can do so by checking out my page on iDonate. All proceeds raised will go directly to the Voices coffers. Voices is a parent run organisation that provides vital speech and language therapy appointments for children and adults with Down syndrome living in the Galway area. They’re the ones who funded Mini’s Little Owls group and will continue to support her as she grows with crucial one on one sessions. The charity receives no government funding whatsoever and requires a minimum of €130,000 to sustain itself annually. Anything you can donate will be greatly appreciated! 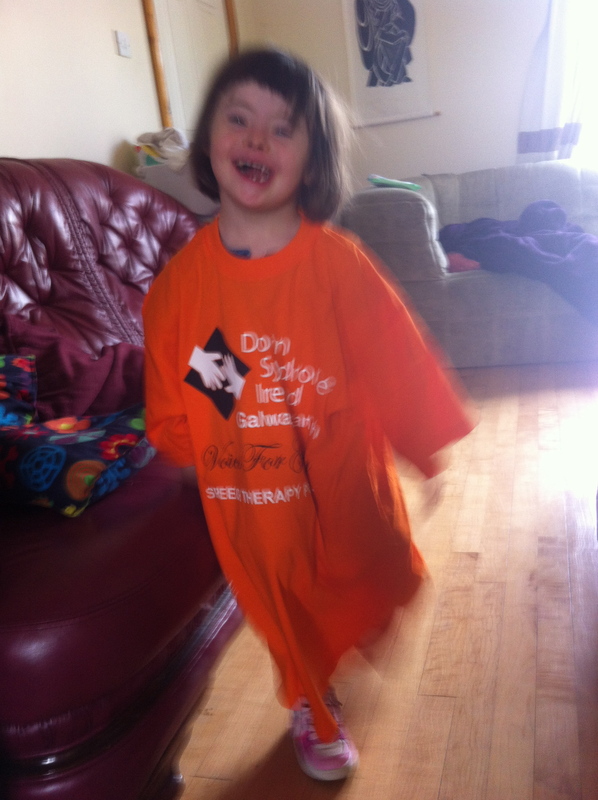 Here’ s Mini mid dash modelling my lovely Voices for Galway t-shirt-I won’t be missed in that colour anyway! I should just get her to run it for me. She’d be more than able! !